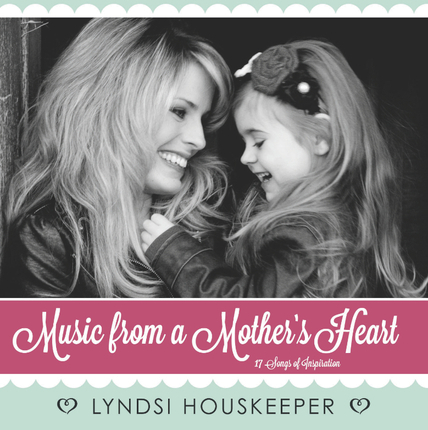 Lyndsi Houskeeper has a remarkable way of capturing life's experiences and emotions and conveying them through music. With her pure voice and guitar in hand, she shares her songs with audiences of all ages at concerts and firesides throughout the west. Lyndsi has written and performed songs for several organizations, including Relief Society and Young Women's groups in many stakes. Lyndsi states that she is just grateful to be able to help people by doing something that she loves. What a beautiful CD, perfect for Mother's Day! Her angelic voice and inspired music and lyrics have brought me peace more times than I can count. This collection of songs speaks to all mothers, giving voice to thoughts and feelings that haven't been described before. Lyndsi has an amazing gift to take all that is beautiful and put it into verse and music. This is such a special collection of some of her greatest songs. I love every one on this album. Listening to her music is like listening to heaven whisper to your soul. It fills you with hope and love, and everything good. It is definitely a CD that every mother can relate to and find hope and strength through. I love everything about this one! This is yet another inspiring album that Lyndsi has created. I love every single melody on this cd. The songs are so touching and remind me of how wonderful it is to be a mother. I am trying to choose a favorite but each song stands out and delivers a beautiful message. I could listen to these songs over and over again! Lyndsi is incredible and she is so dear to my family and I. We just love you and want to thank you for sharing your sweet gift of music and for being the best mother I know! The perfect gift for the special mothers in your life! I was so excited to receive Lyndsi's new CD, "Music from a Mother's Heart"! It is the perfect gift for the special mothers and friends in your life, and one that you will enjoy listening to for years to come! The songs are beautiful, heartfelt, and tender. I especially enjoyed reading the stories behind each song. This CD will truly touch your heart! Lyndsi is truly one of the most amazing singers. Her soft voice is so easy to listen to. I have been recovering from a illness that almost took my life and listening to her brings me such comfort and hope. I have seen Lyndsi with her children ... You can tell they mean the world to her. She is a very loving mother to them. Sweet tribute to moms...amazing and inspiring! So amazing! Lyndsi, you never cease to amaze and inspire me! I love these songs! I love the messages of each and every song and I love how you've arranged them. As a mother, I love how each one speaks personally to me. This album is a sweet tribute to mothers! Thank you Lyndsi for sharing your talent with us! I love listening to songs writen by their mother to their children. We are so blessed to have these angels in our lives, and Lyndsi writes beautiful songs to show the love that she has for her children. My favorite song is: I live for that. I have heard her sing it live, and it was so touching. I am excited that it is on this cd!